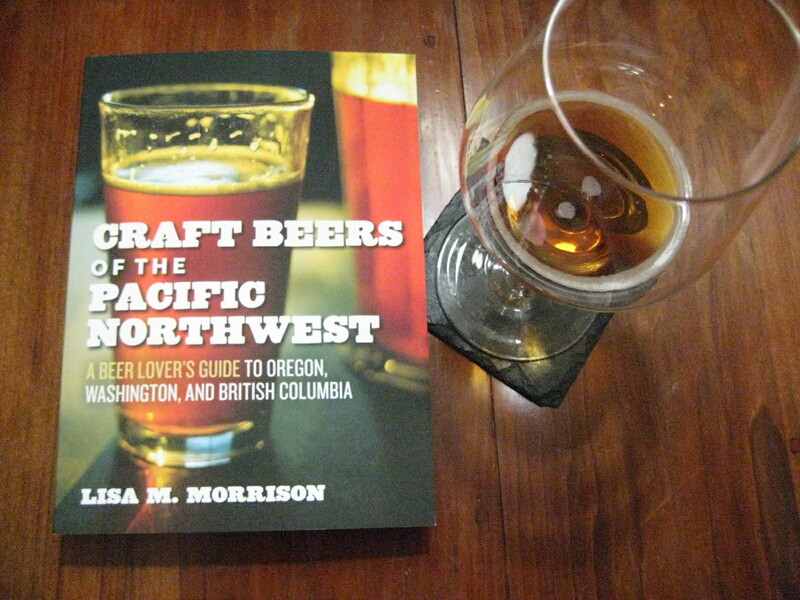 Portland's Beer Goddess herself, Lisa Morrison, is the author of a new guidebook: Craft Beers of the Pacific Northwest, published in paperback by Timber Press. It's a nice overview of the beer scene in our region, written in a pub-crawling style, where a paragraph about one pub rolls into a description of the next brewery in town. Indeed, the chapters are peppered with suggested pub-crawl itineraries sketched out on simple maps. I've been flipping through a copy that the publisher gave me, and I'm happy to recommend it to anyone planning any beer travel in Oregon, Washington, or British Columbia. The most obvious book to compare Craft Beers to is the Good Beer Guide West Coast USA, published in 2008 by CAMRA (here's my review of the GBG). Whereas the GBG attempts to be an almost encyclopedic list -- think a Best Western or AAA guide to beer -- Craft Beers only aims to hit the high points in a readable, narrative format. The books don't exactly overlap geographically. Lisa's book includes British Columbia, which I found to be an unfortunate omission from the other book; on the other hand, the CAMRA guide does cover California, as well as Alaska and Hawaii. Furthermore, you might be amazed at how dated the Good Beer Guide has become in the short span of 3 years. Not only have several good pubs in Portland alone closed in that time -- and new hotspots like Apex, Hop and Vine, and Beermongers have come along -- but it's amazing to think that it was written in the pre-Saraveza era, and before Ron Gansberg's now-famous sour beers merited any mention in the entry on Raccoon Lodge. So Craft Beers has the edge of being more up-to-date. Another difference in the two books is Craft Beers' greater focus on the people behind the beers and establishments it talks about. There is a little bit of that in the Good Beer Guide, but not nearly as much. The narrative style of Craft Beers allows for more of that to come out, and I especially enjoyed reading some of the anecdotes about less talked-about breweries like Mia and Pia's or Beer Valley. Compared to the slick and glossy GBG, the two-color printing of Craft Beers is not as much of a looker. I understand, 4-color printing is a great deal more expensive. Still, the second color could have been used to greater effect in the printing, to highlight pertinent information in the book. At the very least, I wish that pub and brewery names had been put in bold face -- sometimes it's difficult to quickly scan through a chapter to the information you're seeking. On the plus side, the "Don't Miss" boxes at the end of each subchapter are a short and sweet way to present the highlights. Pub names and addresses are conveniently called out into the margins, though there are a fair number of oversights: in the Portland section I noticed that Saraveza, Higgins, and the Cheese Bar all showed up in the text, without their addresses appearing in the margin. And hours of operation would have been a handy piece of information to include -- that's one thing the Good Beer Guide did really well. I already mentioned the pub-crawl maps that run all through Craft Beers. It's a very useful feature to provide you some beer itinerary ideas -- all short enough to be covered on foot -- and the pub crawls serve in some sense as the backbone of the book. The simple maps don't look as fancy as the regional maps in the Good Beer Guide, but they have just the right level of detail and are actually more useful than the GBG maps, which are often inaccurate and needlessly cluttered. A few of the Craft Beers maps are confusingly hacked into pieces when they could have been made more readable by simply reorienting them on the page and/or changing the scale -- the SE Division Street pub crawl is an example of that. But most of them fit on the page without being broken up; those give you an easy-to-grasp birds-eye view of the various beer neighborhoods. I'll do a review soon, too. (I had actually hoped to get it up today--but now I'm glad I waited. Groupthink!) The one thing that shocked me is that Timber didn't create an accompanying app.